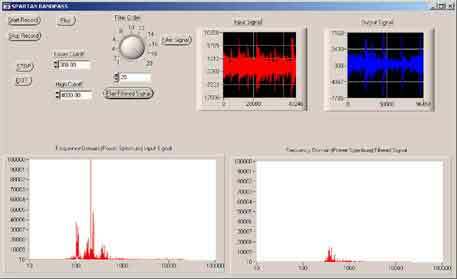 Spartan Bandpass is a software that allows you to turn your PC into a digital filter. It records input from your soundcard and allows you to view its time and frequency domain displays. You can then perform a butterworth bandpass filter operation on the audio file and see and hear the results. Runs on Windows 95 and above. This software was part of my senior project for my BSEE. Click HERE to read the report. Here is the User's Manual for Spartan Bandpass.